What is it that makes a decade fashionable? In the 1920s, the style was suited to high rolling gangsters and bootleggers and their mistresses; in the forties we have style icon Katharine Hepburn, with her long-sleeve, elegant dresses. By the 1950s, Marilyn Monroe’s glamour emerged, a dress paired with satin gloves. While the early sixties saw the high-waisted, very feminine skirts and dresses, now picked up as a style by Banana Republic. Several decades throughout the 20thcentury strike me as recognizable, distinguished, and appealing to modern day men and women. With the popularity of the show Mad Men, based on the advertising executives of Manhattan in the early 60s, the fashion world has taken its proper cues and many people are tuning in to vintage looks for occasions both casual and formal. However, something more unappealing has made its way back into the fashion industry: the 1980s. Black sunglasses with neon arms, in the vein of Tom Cruise in Days of Thunder, are given out for free by phone companies; bright yellow, pink, and blue neon clothing abounds in both teenage and adult venues. And then there’s my own recent purchase: a pair of massive, light pink flower earrings (from Aldo) that are strikingly similar to earrings I have in my costume box. They belonged to my mother in the eighties. When I got home and tried them on (they looked hideous), I realized that I subconsciously thought they were cool. This is what the fashion industry does to us, and what it did to us again and again during both the eighties and the nineties. Anyone who graduated from high school in those decades can attest to the fashion atrocities that have now become their prom photos for life: perms, flower print dresses, the “Rachel” haircut (which was actually really cool at the time, I have to admit), a lot of curls and poufs of hair, usually in the front, held in place by a Goody metal clip and a lot of hairspray. Also, high-waisted, baggy pants are making a comeback, which I will a) never look good in; and b) never fully understand. The only person who could really pull those off was MC Hammer. Were those other decades truly fashionable in the sense we think they are? Or is it the ability to be picky and only choose the best fashions from those eras that allows them to be timeless? Perhaps we need more distance from the eighties and nineties in order for them to be more attractive. But when an image of Michael J. 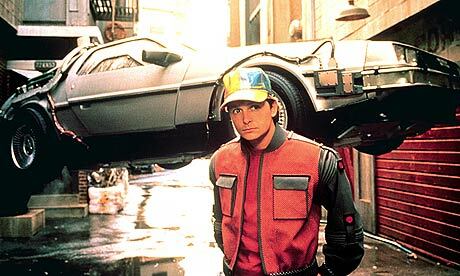 Fox (as adorable as he was) from Back to the Future 2 comes to mind, I can’t help but think those fads have met their expiry date. My advice to you, which you may or may not choose to take, is always consider this: if I look back at this in 20 or 30 years, will it still look good? However, if you catch yourself buying a scrunchie, it’s already too late. This entry was posted in Fashion, Popular Culture and tagged 80s, back to the future, days of thunder, fashion, sophie boyer by sophboyer. Bookmark the permalink. You forgot about banana clips, I loved those!